I love homemade bread, and I love making it. Ever since Slow Food BU did a Sourdough and No-Knead Bread Workshop with the Urban Homesteaders' League, I've been all about no-knead bread! At the bread workshop, Lisa Gross of the Urban Homesteaders' League demonstrated her no-knead bread recipe. 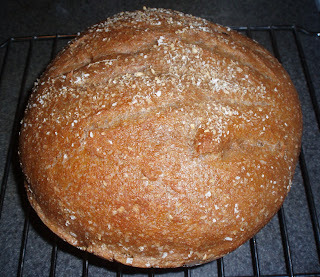 However, at home, I first tried Jim Lahey's no-knead bread introduced by Mark Bittman in the New York Times article The Secret of Great Bread: Let Time Do the Work. This dough is so sticky and hard to handle, that it's basically impossible to knead. Making the bread simply requires mixing the ingredients (flour, yeast, salt, and water), letting the dough sit for 12-18 hours, shaping the dough and letting it rise for another 2 hours, and then popping the dough in the oven. As if this method couldn't get any easier, Jeff Hertzberg and Zoe Francois later developed another no-knead bread method, Bread in 5 Minutes a Day. This recipe requires more yeast than the other method, resulting in a faster rising time. The ingredients (flour, yeast, salt, and water) are mixed to form a dough, let to sit for 2-5 hours, refrigerated at this point for storage or shaped and let to rise for another 40 minutes, and then put into the oven. One great thing about this bread is that the dough can be stored in the refrigerator for up to two weeks, and every day, the flavor of the bread develops as more fermentation occurs. Whenever you want freshly baked bread, you can take a portion of the dough out of the refrigerator, shape it and let it rise for 90 minutes (instead of the 40 minutes required for room temperature dough), and then put it into the oven. Read this article for a recipe and more information on this no-knead bread method, read the New York Times Article Soon the Bread Will Be Making Itself, or check out the book Artisan Bread in Five Minutes a Day. These no-knead bread recipes don't require kneading because of the wetness of the dough- the high moisture content allows the gluten molecules to align faster and more easily than in drier bread doughs. Making no-knead bread is extremely easy and results in delicious bread with great visual appeal, good structure, and a crunchy crust; and the variations and possibilities are endless! 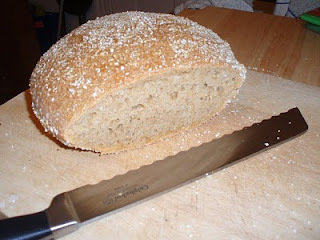 I really enjoy making (and eating) homemade bread. Although I also enjoy kneading bread (or perhaps I enjoy this step because who knows if I'm doing it correctly), when I find myself very busy, the no-knead method is a happy medium. I also love what Satish Kumar said at last year's Future of Food Conference at BU: "If you don't have time to bake bread, you don't have time to live." (Read Satish Kumar's posts Reconnect with Tradition: Baking Bread as a Spiritual Act and Real Bread). So what are you waiting for? Go bake some bread!